I like reading in my comfort zone. And my comfort zone usually means strong women in fantasy. However, I also try to stretch myself, to read something that will introduce me to an unfamiliar culture or experience. Zetta Elliot’s Ship of Souls seemed to be the perfect compromise – a fantasy featuring a young black boy, set in (of all places) Brooklyn. When Dmitri, an 11-year-old bird watcher and math whiz, loses his mother to breast cancer, he is taken in by Mrs. Martin, an elderly white woman. Unaccustomed to the company of kids his own age, D struggles at school and feels like an outcast until a series of unexpected events changes the course of his life. First, D is asked to tutor the school’s basketball star, Hakeem, who will get benched unless his grades improve. Against the odds, the two boys soon realize they have something in common: they are both taunted by kids at school, and they both have a crush on Nyla, a beautiful but fierce eighth-grade girl. Then Nyla adopts D and invites him to join her entourage of “freaks.” Finally, D discovers an injured bird and brings it home from the park. D is stunned when the strange bird speaks to him and reveals that she is really a guiding spirit that has been held hostage by ghost soldiers who died in Brooklyn at the start of the American Revolution. As Nuru’s chosen host, D must carry her from Brooklyn to the African Burial Ground in lower Manhattan, but the ghost soldiers won’t surrender their prize without a fight. With the help of Hakeem and Nyla, D battles the Nether Beings who lurk underground, feeding off centuries of rage and pain. But it takes an unexpected ally to help the trio reach the ship that will deliver the innocent souls of the dead back to Nuru’s realm. 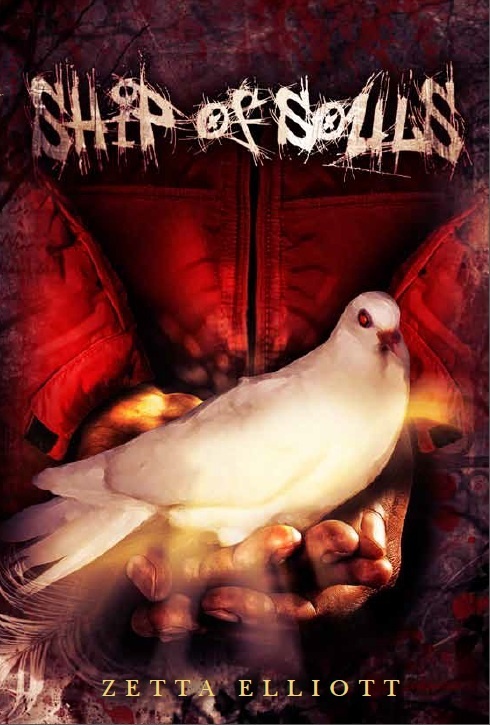 An urban fantasy infused with contemporary issues and historical facts, Ship of Souls will keep teen readers gripped until the very end. D has been on his own since his mother died of cancer. But being a math geek in New York City and trying to navigate school, a foster home and a new baby foster sister doesn’t leave much room for healing and hope. D eventually makes friends with some of his schoolmates, but then his life is interrupted by the appearance of a white bird that is more than it appears. It asks him an important question, and his answer takes him on the adventure of a lifetime, and through the historic past of the city he calls home. First, let’s do the positive: for the first thirty pages of Zetta Elliott’s Ship of Souls, I was hooked. Here was an urban fantasy, featuring a black male protagonist, and his world and grief were vividly described. My sympathies were engaged, I was interested in the great characterization of the three teens at the focal point of the story, and I kept thinking to myself, “Oh, this is good,” with a little bit of relief, and a lot of anticipation. I spent a lot of time trying to figure out what, exactly, went so wrong. It was more than the inclusion of fantastic elements, because some of those worked, and worked well (the descriptions in that final scene underground were rather glorious). I think, and this is totally subjective, that there were two major issues. The first was uneven, stilted dialogue. The story was at its strongest when told in D’s head, from his personal point of view. It faltered numerous times when the reader was supposed to gather information and see plot movement solely through the medium of dialogue. In this case, not enough was SAID or added to the context of spoken words to make sense of scenes, characters, and swift plot changes. Second problem: flat secondary characters. Elliott made D, Keem and Nyla real in the mind of the reader and each of these had different, understandable and complex motivations for his/her actions. On the flip side, the secondary characters, such as Nuru, Nyla’s mom, the soldiers and D’s foster mother, served only to point out character quirks and reasoning of the main characters. And yes, I said even Nuru. Billy, I give a free pass. Main lesson? Wherever characters-as-plot-devices go, disappointment is sure to follow. While not without merit, this book could have done with more: a) developed dialogue, b) fantasy and history world-building, and c) secondary character development. Final verdict: Ship of Souls will leave the reader confused by its split personality, disappointed by its spoilt promise, and wholly underwhelmed. Want a second opinion? The Book Smugglers posted an extensive (and much more positive) review. Recommended for: those interested in an urban fantasy featuring a POC main character and the ghosts of New York City, and anyone willing to take a chance on a short, uneven and non-traditional tale of redemption and friendship. First, before you do or think anything about the book I’m going to mention, look at its gorgeous cover art. Possibly sit and drink it in, if you have the time. Okay, done that? Well, I don’t see how you could NOT want to read the book. However, if you haven’t fallen under the sway of the cover... I shall parade a few facts! Middle Grade. Fairy tale. A story within a book that changes as it is told—or acted out. Dragon. Clever, reckless princess. My dears, this novel sounds lovely and a bit like Catherynne M. Valente’s Fairyland books. Which are some of the best children’s books ever. I can tell this story and I will get along like a house on fire. Or possibly like a clever princess and an unusual dragon. 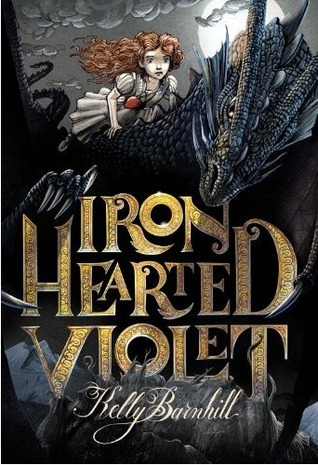 Iron Hearted Violet by Kelly Barnhill will be published by Little, Brown Books for Young Readers (Hachette), and releases on October 9th, 2012. The end of their world begins with a story. In most fairy tales, princesses are beautiful, dragons are terrifying, and stories are harmless. This isn't most fairy tales. Princess Violet is plain, reckless, and quite possibly too clever for her own good. Particularly when it comes to telling stories. One day she and her best friend, Demetrius, stumble upon a hidden room and find a peculiar book. A forbidden book. It tells a story of an evil being—called the Nybbas—imprisoned in their world. The story cannot be true—not really. But then the whispers start. Violet and Demetrius, along with an ancient, scarred dragon, may hold the key to the Nybbas's triumph…or its demise. It all depends on how they tell the story. After all, stories make their own rules. Iron Hearted Violet is a story of a princess unlike any other. It is a story of the last dragon in existence, deathly afraid of its own reflection. Above all, it is a story about the power of stories, our belief in them, and how one enchanted tale changed the course of an entire kingdom. 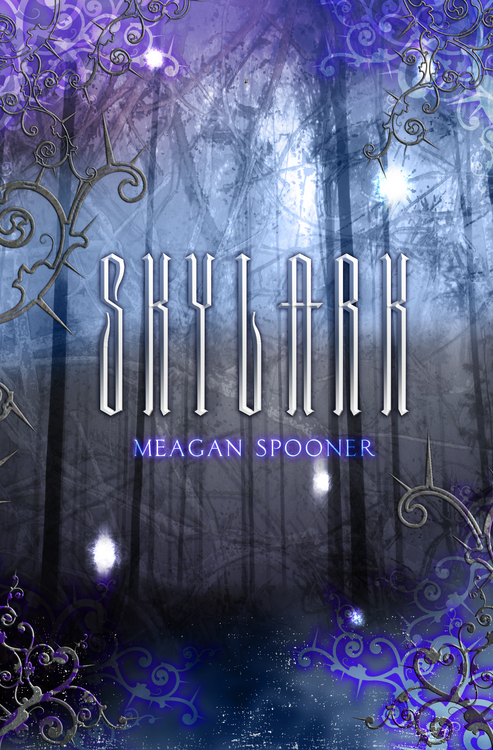 Skylark, Meagan Spooner's debut, is one of my most anticipated releases of the summer (you may have noticed my WoW featuring it last week?). It just so happens that this talented author calls the DC metro area home, and she’s mega-cool. Proof that Ms. Spooner is indeed made of awesome: she’s here today with an author interview. If you’re interested in winning a copy of Skylark, stay tuned until the end of the post – there’s a pre-order giveaway. Because: why the heck not?! Happy Monday! Meagan Spooner grew up reading and writing every spare moment of the day, while dreaming about life as an archaeologist, a marine biologist, an astronaut. 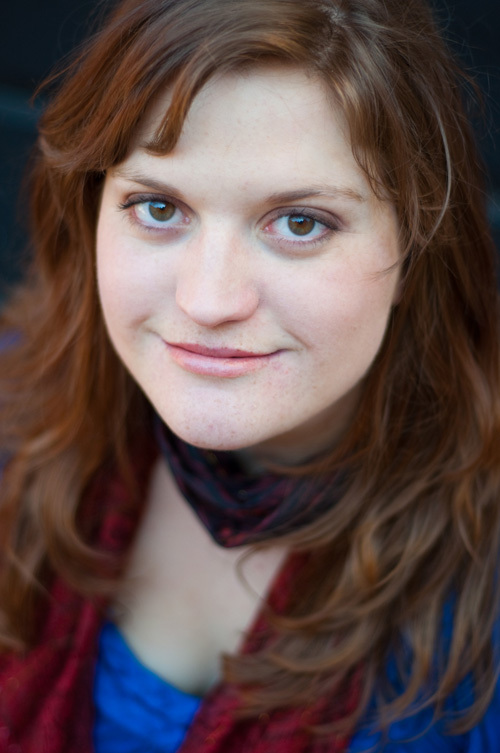 She graduated from Hamilton College in New York with a degree in playwriting, and has spent several years since then living in Australia. She's traveled with her family all over the world to places like Egypt, South Africa, the Arctic, Greece, Antarctica, and the Galapagos, and there's a bit of every trip in every story she writes. She currently lives and writes in Northern Virginia, but the siren call of travel is hard to resist, and there's no telling how long she'll stay there. In her spare time she plays guitar, plays video games, plays with her cat, and reads. She is the author of Skylark, coming out August 1 from Carolrhoda Lab/Lerner Books. She is also the co-author of These Broken Stars, forthcoming from Disney-Hyperion in Fall 2013. The world in which Skylark is set has many unique and interesting features, but one of the most important to the plot is the way technology is 'powered.' Can you share your inspiration for that element of the book (if you know it)? The world was actually the first fragment of an idea for Skylark to come to me. Everything else came later. I was in my car driving home and listening with half an ear to a piece on NPR about the energy crisis, and I started thinking (rather pessimistically) that even if we had it to do all over again, if we had a brand new power source to draw from, we'd likely mess it up again with our greed and impatience for power. I think most people would think things like "solar," "wind," "nuclear"--I, being a huge fantasy geek, thought "magic." And so this world just unfolded in front of me while I was driving, one ruled by magic, where clockwork machines walked up and down the streets and people sailed by in carriages driven by magic. I imagined what it would be like, the day the magic in that world ran out--and that's what led me to the post-apocalyptic-yet-magical world Lark lives in. Magic is a limited resource, one the city's rulers are willing to kill for--and worse. You're a world traveler. Is there a particular place you have visited or lived that inspired the setting of Skylark? The city Lark lives in (and escapes from) in Skylark is actually based off of Washington, D.C., where I've lived almost my whole life. Originally the book was set in a future version of our world, but in revision it quickly changed to its own unique fantasy world, a sort of alternate reality version of D.C. Although the city is never named, its streets and buildings are based on streets and buildings in the actual D.C. The Institute where Lark is taken in the beginning is based off of the buildings of the Smithsonian Institute on the Mall. And when she escapes, the forests and countryside that Lark travels through are based off of suburban Northern Virginia--a lot of the same plants and geographic features. I see that your college major was playwriting. How do you think that has influenced your prose? I think studying playwriting was one of the better things I ever did for my writing. Not only does studying plays (and how to write them) improve your sense of dialogue and rhythm, but it gives you a sense of dramatic structure that, for some reason, is much harder to conceptualize with novels and the study of literature. Every book I write has three acts--and I think of them very much like acts in a play, in terms of what they need to accomplish for story, character, etc. I also studied acting as part of my major, which was tremendous in terms of learning to develop characters. When you act, you spend a huge amount of time getting to know the character you're playing, reading between the lines of the script, even making up elements backstory that never appears in the play just so that YOU know it, so that your character can be a fully fleshed-out person that leaps off the page (or the stage). I'm constantly doing this for my own characters. I have tons of information about them that will never make it onto the page--but maybe I'll get to post them someday as sort of "DVD extras" for the books! Do you have any hidden (or not-so-hidden) superpowers? My secret super power--or perhaps my secret villain power--is that I kill houseplants just by thinking too hard about them. It doesn't matter how much (or how little) I water them, they always kick the bucket sooner or later. I have one philodendron given to me by my mother as a housewarming present that is still alive, ten months later. I'm pretty sure it knows how many of its cousins I've killed over the years, and it's just biding its time, waiting for me to let down my guard. So it can avenge its fallen brethren. If you could invite literary characters to a dinner party, who would be sitting around the table, and what would you serve? Oh, goodness, let me see. I think I'd invite a handful of villains (or antagonists, shall we say), because I find complex anti-heroes to be fascinating. I'd invite Mrs. Coulter (His Dark Materials), Lady Macbeth (Macbeth), President Snow (The Hunger Games), Professor Moriarty (Sherlock Holmes), Tom Riddle (Harry Potter--pref. before he became Voldemort, back when he was a bit more complex as a student! ), Javert (Les Miserables), and Iago (Othello). Just about everyone in my books tends to be a villain in some way, so clearly I have an unhealthy obsession with them. It would be fantastic research. So yeah--I'd get all those guys in a room, and then I'd serve Chesapeake Bay blue crabs in the shell. Partly because they're delicious, but mostly because it's absolutely hilarious to watch people eat them. There's just no way to do it gracefully! And it amuses me to think of a group of scary BAMFs trying to eat crabs in a dignified manner. What books are on your nightstand (or wherever you keep your 'read next!' pile) right now? ...and those are just the ones I can read from here, from my stack! My TBR pile right now is absurd, especially coming off of BEA. Thank you, Meagan! I am even more excited to read Skylark now… if that is possible (it’s really not). Oh! And move For Darkness Shows the Stars to the top of your pile – that is one fantastic book. Meagan Spooner's debut YA novel will be released on August 1st, 2012 from Carolrhoda Lab. Want to win a pre-order of Skylark? Simply fill out the FORM. One entrant will win a pre-order from either Amazon or The Book Depository. Giveaway open internationally, will end on July 9th, 2012 at 11:59pm EST. Winner will be notified by email. Good luck! Vis in magia, in vita vi. In magic there is power, and in power, life. I had an epic baking fail this week. Trashed three trays worth of cookies fail. This is not one of the 'fails.' 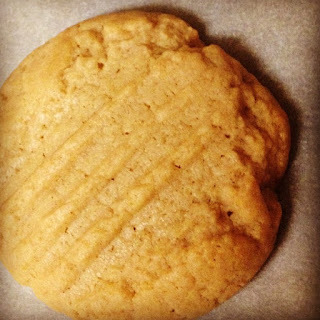 It's a perfectly delicious Peanut Butter and Honey Cookie. It was a coworker’s birthday, and for favorite coworkers I will bake (note to everyone: if i like you, i will bake. that’s how you know.). I asked what he liked in the way of baked goods. He said peanut butter cookies. I thought to myself ‘Perfect!’ Then I looked at my staples (sugar, flour, so on) and realized that I was out of white sugar. No problem, right? I’ll just substitute…something. Turns out I had a jar of molasses. Well, that’s easy! 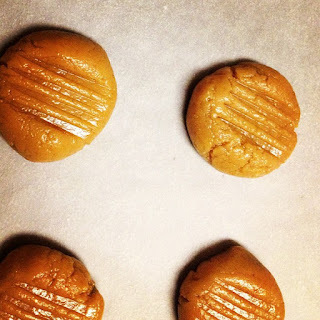 Just find a peanut butter recipe that uses molasses! So I found a recipe. And I made it. And those cookies look good, right? Well…they tasted like hell. And by that I mean they tasted like SULFUR. 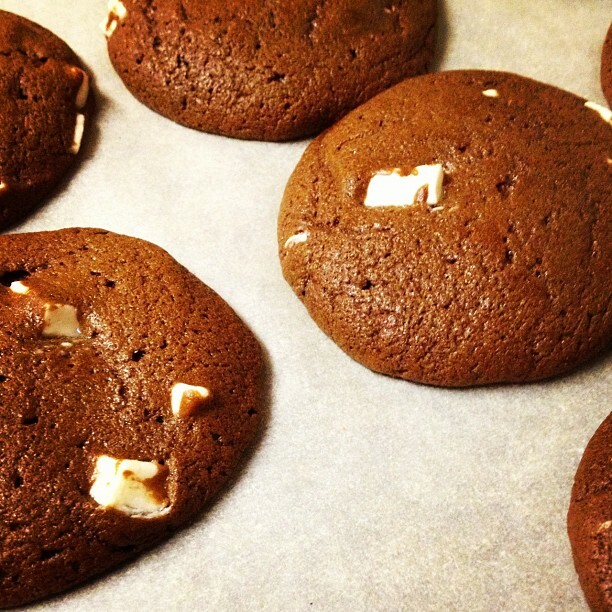 I had a whole batch of Peanut Butter Molasses Cookies with White Chocolate Chunks, and they reminded me of fire and brimstone and spoiled eggs. Why? Apparently the fancy, expensive organic molasses I bought was blackstrap molasses. And that stuff is only decent in VERY small quantities. I should have used refined molasses. NOT GOOD. I was so disappointed I threw out the whole mess. To recap: I wasted all that time and still didn’t have white sugar or cookies to show for it. %&$^!!! Desperate times call for church cookbook recipes. You may not know this about me, but I was raised Southern Baptist. In Seattle. Yeah, figure that one out (i still haven’t). But back to the matter at hand: those church ladies are SERIOUS about their cookbooks. I pulled out the most recent (my mom gave it to me for Christmas a couple of years back) and looked up peanut butter cookies. And… there it was, an easy peanut butter recipe with honey – no white sugar or butter needed. Amen. Combine honey, oil, peanut butter and eggs in a stand mixer and beat on low until combined. You can also mix by hand or with electric mixer on low setting until smooth. Pro tip: spray your measuring cup with baking spray before you pour in the honey and peanut butter. This will make it much easier to get your ingredients into the bowl later! Whisk dry ingredients together in a separate bowl, and add in two parts to the honey mixture, blending well after each addition. Roll dough into walnut-sized balls and place two inches apart on the parchment-lined cookie sheets. Flatten with a fork and place on middle rack in the oven. Bake for 10 minutes and take out promptly – you don’t want to burn the bottoms! Yields 18 cookies. As you can probably tell, this is a Very. Easy. Recipe. I would recommend it to beginners without a qualm. 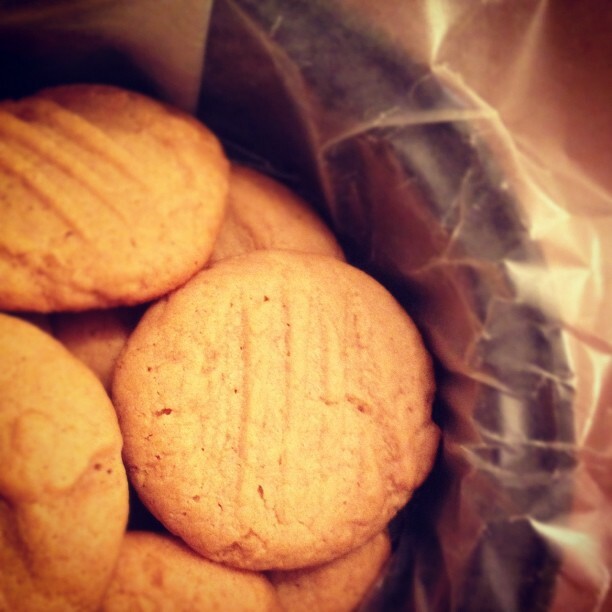 It’s worth it to note that it is also a sugar-free and butter-free peanut butter cookie recipe. That has to count for something, right? We’ll pretend it’s healthy. Oh, and coworker? Pleased to bits. Sweet success. Recommended for: peanut butter lovers, the baking beginner as well as the veteran, anyone looking for a sugar-free peanut butter cookie recipe, and those experimenting with delicious oil-based baking projects. Interested in other food-related posts? Check out Beth Fish Reads’ Weekend Cooking. Retro Friday is a weekly meme hosted at Angieville that focuses on reviewing books from the past. These can be old favorites, under-the-radar treasures that deserve more attention, woefully out-of-print books, and so on. Everyone is welcome to participate! Many a woman who found her love of reading early will fondly reminisce about her ‘horse period’ – when she read anything she could get her hands on that had to do with horses, such as the Marguerite Henry books (Misty of Chincoteague!) and Black Beauty. There’s a smaller and more select group that can reminisce about their ‘dragon period.’ I say this because I know: I went through both. However, unlike horses, my love of dragons and dragon-lore has lasted well into adulthood. And those early dragon books that I devoured were written by the likes of Jane Yolen, Patricia C. Wrede and Anne McCaffrey. Forbidden by her father to indulge in music in any way, fifteen-year-old Menolly of Half Circle Hold on the planet Pern runs away, taking shelter with the legendary fire lizards who, along with her music, open a new life for her. 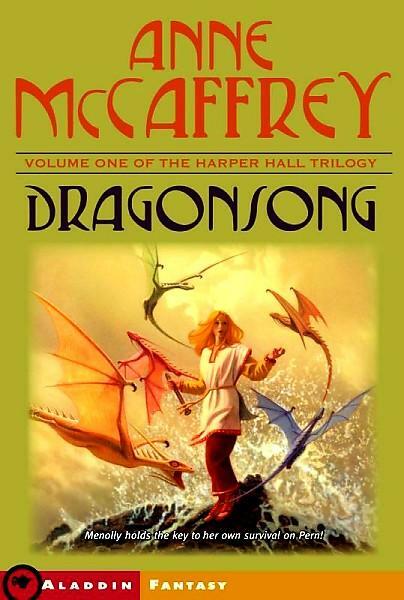 Dragonsong is the first book in McCaffrey’s Harper Hall trilogy, a set of sci-fi books for younger readers – today we’d probably call them middle grade. The series is set on the planet Pern, where colonists fight the life-threatening Thread that falls from space with dragonfire (it’s all explained in less fantastic terms than that in the book, trust me). The story follows gifted musician Menolly, youngest daughter of the head of fishing-centric Half Circle Hold, as she struggles against the restrictions of Hold life and traditions that state that women cannot be Harpers. 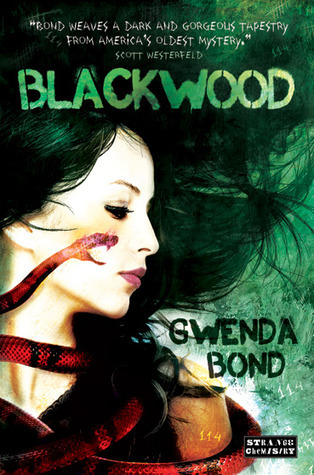 The injustice finally becomes too much and Menolly flees, only to discover a nest of fire lizards, a new life, and a destiny that will take her far from anything she has ever known. Oh, this book. I must have gotten it at a Scholastic book sale or similar, because I distinctly remember that I bought it because: DRAGONS! and also because there was a $1.99 sale sticker on the front cover. And then, after I was swept into the world of Pern and dragons and fire lizards, I discovered it was the first in a trilogy and had to read the next two immediately. Thank goodness for libraries. The main thing I remember feeling when I read this as a child was just how unfair life was for Menolly. Rereading it now as an adult I still feel the injustice of her situation, even to the point of tears – but it is tempered now with knowledge. Menolly’s life is narrow because she lives on a colonized planet, in a very traditional community, and there are no options for, or knowledge of, anything different. Her family forbids her musical tinkering not solely out of spite, as I thought when I was younger, but out of fear. Half Circle Hold is a patriarchal, sexist society that doesn’t know how to change for the better, so it keeps a stranglehold on Menolly. And it is that attitude that eventually forces her flight into the unknown. Of course, that flight is what saves Menolly, but it also breaks her spirit and effectively cuts her off from the past. This is one of the clearest examples I can think of in fantasy and science fiction of leaving the past and pushing into the future. It’s an effective narrative to be sure, but I now also think of it as a metaphor for all sci-fi: leaving the repressive, traditional world of the past and pressing on into the future and new and greater heights. But I mentioned dragons! Well, I’ll deliver (to a degree). Menolly encounters fire lizards, the dragons’ smaller cousins, and these tiny creatures are not only her personal salvation, but they are also her introduction to the life she was meant to live – with enlightened friends and the possibility to follow her musical dreams. I won’t say any more about the book, as you should just read it yourself. It’s wonderful, and for all ages. Recommended for: fans of adventurous middle grade fiction, those who enjoy (or would like a well-written introduction to) science fiction and fantasy, and anyone who missed their ‘dragon period’ and needs to make up for lost time. There’s this book. It has beautiful, understated cover artwork and fascinating back cover copy. A lot of books have that, though. How about a book that seems as if it was written specifically to appeal to my tastes? Meagan Spooner’s debut novel Skylark is a young adult fantasy, with shades of dystopia and a hint of steampunk. MORE THAN OKAY. I am totally into this book, and I haven’t even read it yet. Skylark will be published by Carolrhoda Lab (Lerner), and releases on August 1st, 2012. “Not being able to explain why he was worried didn’t change what he knew. Here’s something that will surprise exactly no one: my favorite Jane Austen novel is Persuasion. I may have mentioned it a couple of times on the blog (not obsessed at all…). It has been my favorite Austen book ever since I read it during my freshman year of college. I reread it regularly, and I think Anne and Captain Wentworth’s story is not only timeless, but that with its inner tension and repressed desire, the romance is absolutely swoon-worthy. We’ve established my longtime love of Persuasion. When I heard that Diana Peterfreund was writing a sci-fi retelling of my Austen favorite, I might have flipped out. Danced around the room? Definitely had a huge grin on my face. To quote myself from a ‘Waiting on’ Wednesday post, “It’s going to be SO GOOD! And you don't even know how tempted I am to use multiple exclamation points there.” Without further ado: For Darkness Shows the Stars. A post-apocalyptic world that was decimated generations ago by genetic-level malfunction (and then worldwide warfare) is now ruled in name by the Luddite community, who shun technology and innovation as the cause of humanity's downfall. Elliot North is born into that world a Luddite, given a privileged upbringing and education, and handed far more responsibility than she is ready to handle. Her best friend Kai was born a servant and worked long hours on the North estate. When Elliot refused to run away with him Kai left on his own, and now, several years later, he has returned to the estate – but not to Elliot, and not as Kai. What follows is a deeply romantic story of redemption, forgiveness, and unlooked-for progress that might just tear a society apart. Better to get it out in the open: if you’ve read Persuasion, you know how this ends. But that doesn’t make the journey, or Diana Peterfreund’s prose, any less wondrous. Peterfreund has developed a reputation for writing nuanced female characters who face unimaginable challenges. In Elliot, I think she has created her best heroine yet – a girl who is bound by responsibility but pines for passion, who is unappreciated by her peers but continues to do what is RIGHT. It’s not that she’s miraculous or angelic – she’s just doing the best she can in a strange, fractured world. The story’s focus on thought life lends itself to descriptions of the characters’ pent-up emotion and their mingled misery and hope. For Darkness Shows the Stars is full of that, but it never loses itself in the description, nor does the pace or tension lag. The narrative is broken up in parts by letters and notes passed between Elliot and Kai over the years, but these add to the story, providing important ‘flashbacks’ and insight into the characters’ pasts, revealing the patterns and prejudices that shape their personalities. Peterfreund’s sci-fi is thin on science but heavy on the consequences of that science (definition: post-apocalyptic). Her descriptions of life in a Luddite-ruled world are both detailed and chilling, and remind the reader that humans are both good AND evil. When you’re in the midst of reading it will feel too possible. 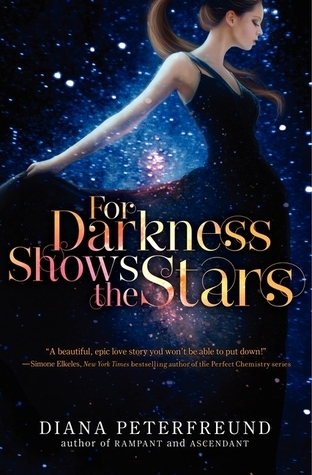 In all, I believe that For Darkness Shows the Stars is a masterfully written novel that explores the nature of love, duty and evolution, while showing that true feeling will find a way to survive. Recommended for: fans of the Jane Austen original, Anne Osterlund’s Academy 7, and anyone with a soft spot for extremely well-written sci-fi/fantasy that seethes with romantic tension while at the same time exploring themes of future, ethics, duty, and hanging onto the past at the expense of the present. 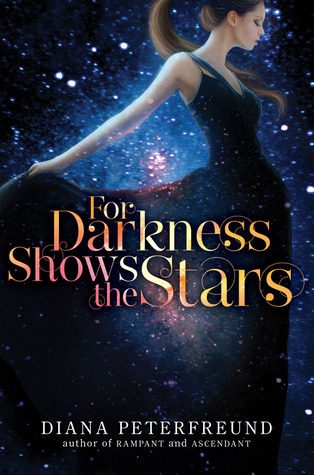 Fine print: I received a signed, finished copy of For Darkness Shows the Stars from the publisher for review at Book Expo America. My friends are good about having parties. Not crazy parties – it’s usually an extended group of friends mingling and eating whatever food is on offer and taking sparing sips of the beverage of choice. We might break into dance or someone might take out a guitar and serenade the rest, but it’s happy, low-key fun. And… I am known for bringing baked goods to these parties. It’s almost a tradition now, and definitely a challenge. What to make next that won’t kill me with the effort but will feel special? For yesterday’s party I found a delicious cookie recipe that I know I’ll make for years to come. Preheat the oven to 350 degrees F. Line cookie sheets with parchment paper. In a medium bowl, whisk together the flour, cinnamon, cayenne pepper, salt, baking powder and baking soda. Set aside. Combine the butter, sugars and cocoa powder in a large bowl (or in stand mixer bowl), and beat on medium speed with electric or stand mixer for about 4 minutes. If you’re using elbow grease… good luck. Scrape down the sides of the bowl. Add the eggs one at a time, and mix until blended after each addition. Add the vanilla along with the last egg. Continue mixing on medium speed until well blended, about 1 minute. Add the four ounces of melted chocolate and mix again until just blended, about 30 seconds. Then mix in the flour mixture in two parts on low speed, waiting until first half is incorporated before adding the rest. 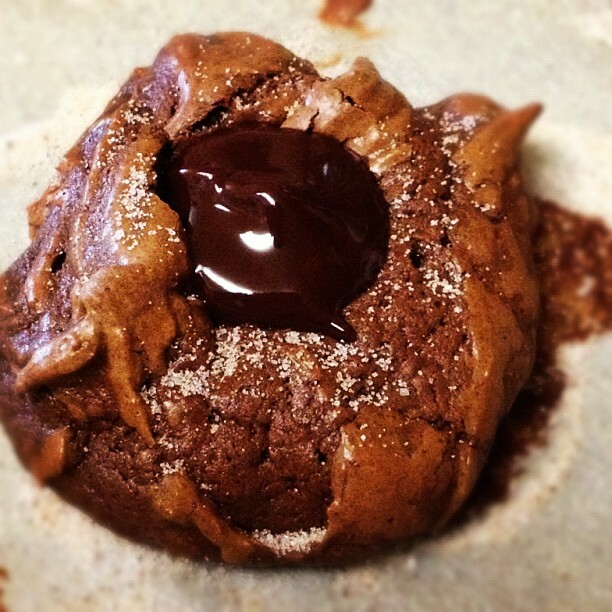 Using an ice cream scoop or a Tablespoon measure, shape the dough into balls and drop onto the prepared cookie sheets. If you use two racks at the same time, switch cookie sheet positions halfway through baking time. Bake 11 to 13 minutes. Right after taking the cookies out of the oven, make a small, deep well in the center of each cookie, using the rounded side of a 1/2 teaspoon measuring spoon. Dust with cinnamon sugar if desired. Let the cookies rest until completely cool. For the filling, melt the remaining chocolate and the butter in the microwave (heating for 30 seconds and then stirring, 15 and then stirring, and then at 10 second intervals as necessary) or in a bowl set over simmering water on the stove, stirring with spatula until smooth. Remove from heat and set aside until cool and slightly thickened. Place chocolate mixture in a small zip-top plastic bag (or a pastry bag fit with a small plain tip). 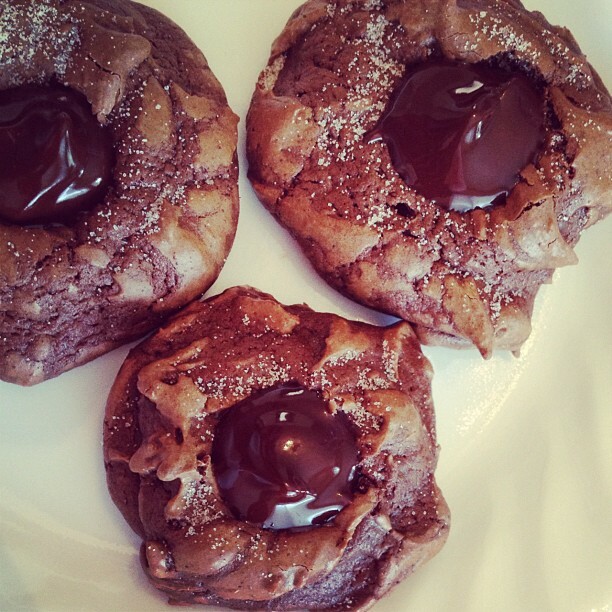 Cut off a small piece of one corner of the plastic bag and pipe the chocolate into the wells of the cookies. Set aside for one hour, or until the chocolate is firm to touch. Serve immediately or store in an airtight container at room temperature for up to 3 days. Makes approximately 3 dozen cookies. Altogether this recipe ROCKED. My only note is that it was a wetter batter than I’m used to dealing with for cookies – almost a brownie consistency before it went into the oven. No complaints, though – it made for a chewy, delicious cookie! The cookies got rave reviews at the party, too: for the hint of spice, deep chocolate flavor and surprising texture. I’ll be making it again, for sure. Recommended for: a special occasion cookie with a bit of complexity, a Mexican chocolate treat, and a lovely chocolate dessert that won’t take hours of preparation, but will still impress the guests. Interested in other food-related posts? Check out Beth Fish Reads' Weekend Cooking. I have a bad habit. And that bad habit is not talking about the books I read in between the YA and middle grade fantasy that I mention in reviews. Oh, I’ll do it now and then – hey look, I reviewed a Sarah Dessen book…once! And I really like Brendan Halpin and Julie Halpern, now that I think about it. But usually I don’t write those reviews of contemporary YA. And that means that you don’t hear about the Sarah Dessen and Susane Colasanti books that I gobble up as if they’re cotton candy. Or the Georgette Heyer (historical!) or Betty Neels (charmingly innocent & old-fashioned!) romances, either. But hey, today is all about the confessions. It’s also about Susane Colasanti’s latest read, Keep Holding On, which I just finished. And am reviewing. Rightnow. Noelle's life is all about survival. Even her best friend doesn't know how much she gets bullied, or the ways her mom neglects her. Noelle's kept so much about her life a secret for so long that when her longtime crush Julian Porter starts paying attention to her, she's terrified. Surely it's safer to stay hidden than to risk the pain of a broken heart. But when the antagonism of her classmates takes a dramatic turn, Noelle realizes it's time to stand up for herself—and for the love that keeps her holding on. Noelle Wexler has been bullied for years, and she’s marking off the days until the end of high school. Her home life is horrendous, her nemeses at school are making life hell, and all the while she’s having a tough time believing that there IS something better out there. That she can be worthy, and move beyond, and even just keep holding on. When events come to a head and a choice must be made, Noelle has to fight inertia and act – otherwise she might not survive. Colasanti has written a book that faithfully replicates the voice and actions of a depressed, bullied young adult. Noelle’s thoughts are honest and in cases self-harming, and the feelings they evoke are both horrible and true. It is HARD to read these words – they are a physical weight and portray exhaustion with life, with trying to overcome, with making due. It’s all scarily real. And that is, by far, the triumph of the book – in making those heavy, hard things accessible and open to those who have never experienced them. What are less-than-memorable elements, then? The plot, Noelle’s fellow characters, the ending and the final character development. Noelle’s story ends semi-happily and in a hopeful place, a transition that does not seem authentic in the short space of the book. There’s a lot of happy-speak and positive self-talk that takes time to develop in real life, but which Noelle spouts off the cuff one day. Noelle finds herself in a network of supportive friends – after being excluded and bullied for years. It’s… wishful thinking. Not dangerously optimistic, just unrealistic. The unfortunate side effect of wrapping everything in a pretty bow after showcasing the very real horrors of bullying is that it makes the book less effective and less enjoyable than it had the potential to be. Awesome bit: Noelle’s voice, especially in the first ¾ of the book. Not as awesome? The finale. Although the reader is meant to feel hope and possibility at the end, there is instead a pervasive feeling of something along the lines of ‘deflated balloon.’ Weird mental picture, I know, but it fit (at least for me). Recommended for: confirmed Susane Colasanti fans, devotees of Sarah Dessen, those who want to hear a genuine, hurting voice of a bullied teen, and anyone who likes their sad hearts completely mended upon conclusion of the story. I’ve been blogging for over three years. Until this week, I had never been to Book Expo America. I feel lucky to have been able to attend – it wouldn’t have been possible without a bonus at the start of the year and several vacation days from work. For me, this trip was a luxury, one I wouldn’t let myself stress over (because those are VACATION days, dude! ), and one that I wanted to do from ‘outside the box.’ Know what? It was fun. 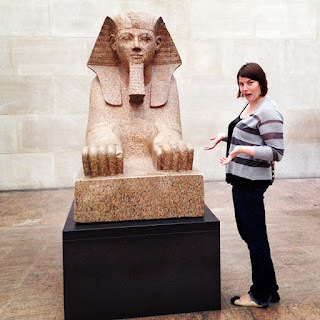 I’m going to lay out the elements of my BEA 2012 experience below, in case you want to borrow them for future planning. And also because I met some great people and ate some delicious food, and those experiences bear recording. 1. Take the bus, not the train (and if you have to fly, i apologize in advance, this is useless advice). Even though I like trains best, the itinerary I would have chosen was just too expensive. But it was okay – largely because of item 2. 2. Bring a friend. One of my non-blogging, real life friends joined me for the first few days of the trip. She wanted to get out and see things and go to cool places and wouldn’t let me sit indoors and obsess about what author would be where and when. We could also commiserate if we picked a bad table at the restaurant and ended up overhearing a bizarre conversation (it happened. little italy.). That’s how memories are made. 3. Get to NYC early. We got to NYC on Friday night. We went out that night and slept in the next morning, by which time we were ready for some Saturday sight-seeing – nothing too ambitious, mind you – we just checked out the Egyptian and American wings of the Met. But while waiting for dinner that night we walked into an open artist studio night. And the next day we dropped by the Brooklyn Flea and went to a Mets baseball game. Going in without an epic master plan can work to your advantage. 4. Think about staying somewhere other than Manhattan central. Like…Brooklyn. You knew I was going to say that! But seriously, I would attribute the majority of my ‘good times’ during BEA to having a cool place to go back to in Brooklyn. I stayed with cousins, but you could consider renting an apartment for a week, and even the hotels themselves are a bit cheaper in the outer boroughs. It does mean you have to take the subway to and from the Javits each day, but the distance was very freeing – I didn’t feel like I was locked into the madhouse 24/7. 5. Plan your meals – with an eye towards quality. You’ll be in New. York. City. The place is teeming with great restaurants, and not all of them will break the bank. Do your research and find great places to eat – that way you won’t have any regrets later about settling for something subpar. If a restaurant meal isn’t in your budget? Make sure you have plenty of fresh fruit and vegetables! A couple of places we tried this trip: Nights and Weekends (for brunch in Greenpoint), Pok Pok (thai dinner in Red Hook), Roberta’s (pizza plus in Bushwick), Ample Hills Creamery (ice cream! in Prospect Heights), & Shake Shack. 6. Have a signing schedule/plan for BEA, but be reasonable. Prep yourself for changes, for being tired, and for the idea that things may not work out. You won’t get every book you want. But you will find that there are so many things on offer that you’ll end up happy. Oh, and expert tip: go to one of the author breakfasts. I heard they were all good, and Lois Lowry’s speech made me cry at the children’s one. 7. If you have publishing contacts, reach out and see if they’d like to meet. I don’t regularly correspond with many publishers – but I did email in advance and ended up having a lovely meeting with one publicist (it totally made my day). 8. Check out social media for news about BEA and outside events. I found out about the Teen Author Carnival and a NYPL Science Fiction, Fantasy & Music evening through twitter links. 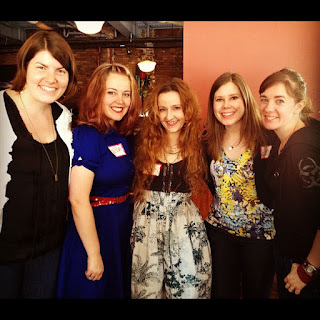 And someone tweeted another link to a Facebook contest to attend a Carolrhoda Lab-sponsored author/blogger breakfast. I entered and won – and it was fabulous. I was invited to one other morning event that I couldn’t make, but KIDS, here’s the deal: I wasn’t invited to publisher parties. And I still had a really good time. 9. Make sure to meet up with your internet friends in real life. If you correspond on twitter or via blog comments, you probably have something in common. Take the extra step and ask them to meet you for lunch, or simply introduce yourself prior to a panel. I was surprised that anyone recognized me – but it was so lovely when they did (or when I did the same thing to them). 10. Mail yourself books from the USPS during lunch breaks, take advantage of bag check the rest of the time, and follow other great BEA advice you can find in preparatory blog posts. I enjoyed myself most when I was wandering around people-watching, not putting limits my time and not worrying about the people ahead of me in line. Thanks to all of the authors, bloggers, publishing contacts (shout-out to college friend Whitney! ), my friend Lauren and especially my cousins Isaac and Jess for making BEA and New York a fun time. I heart you. I have an acknowledged thing for clever middle grade books. I love the sparkle, crackle and wit of their precocious characters. I like that they find ways out of impossible situations with very few tools and never, ever admit defeat. Part of me hopes that their resourcefulness and self-belief is catching, and that I’ll become braver and better simply by reading the book. Oh, and I hope I laugh, too! Today’s WoW pick is a likely addition to this favorite subgenre of mine, and I can’t wait to read it. 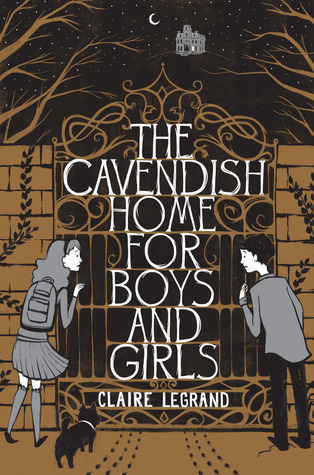 Claire Legrand’s The Cavendish Home for Boys and Girls will be published by Simon & Schuster, and releases on August 28th, 2012. But then Lawrence goes missing. And he’s not the only one. Victoria soon discovers that Mrs. Cavendish’s children’s home is not what it appears to be. Kids go in but come out…different, or they don’t come out at all. If anyone can sort this out, it’s Victoria, even if it means getting a little messy. As mentioned previously, I’m in New York. 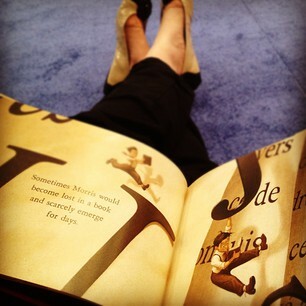 I’m using vacation days from my real job to go to BEA Bloggers and Book Expo America 2012. Real life friends: if you weren’t convinced before, I AM A NERD. Okay, done now. BEA Bloggers was a full day devoted to book blogging. Book bloggers networked, checked out panels on everything from critical reviewing to monetization, and had a chance to meet favorite authors as well as learn and share their tried-and-true methods for keeping things new, interesting and on the right side of the ethical line. My favorite panel of the day was one entitled ‘Demystifying the Book Blogger & Publisher Relationship’ – each of the panelists provided great input and the audience appreciated the topic. On a different note: I got incredibly lucky with my breakfast table and made several new friends (also: was SO HAPPY to find danielle. from My Mercurial Musings sitting right next to me! ask her about the level of happy. it was pretty epic). Best part of the day, by far, was meeting bloggers both new and familiar. I heart you, wonderful book people! One of the books in my ‘swag bag’ at BEA Bloggers (yes, this was a thing!) 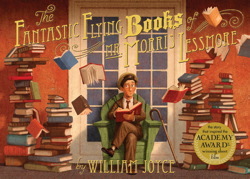 was a charming picture book by William Joyce called The Fantastic Flying Books of Mr. Morris Lessmore. I love a good picture book, though I don’t search them out as often as I should (I have little cousins, but no kids of my own). This? Is a special story in a beautiful package, and one I’ll be buying for many years of baby showers and birthdays to come. The book that inspired the Academy Award–winning short film, from New York Times bestselling author and beloved visionary William Joyce. Everything in Morris Lessmore’s life, including his own story, is scattered to the winds. Stunningly brought to life by William Joyce, one of the preeminent creators in children’s literature, The Fantastic Flying Books of Mr. Morris Lessmore is a modern masterpiece, showing that in today’s world of traditional books, eBooks, and apps, it’s story that we truly celebrate—and this story, no matter how you tell it, begs to be read again and again. Morris Lessmore is in the habit of writing his daily joys and activities in his own book. But when his world is turned upside down, things turn dull and confusing. It takes a special encounter, a flying book and a lady floating through the sky for Morris to find his place among the books. The story is simple, redeeming, and magical. The few lines on each page are almost window-dressing for the lovely illustrations. Those illustrations range from sepia-toned and melancholy to bright, happy and action-filled. There were a couple of page spreads that were particularly wonderful – including the one here (you can see that I enjoyed this book IMMEDIATELY), with its letters and words super-sized and at odd angles. It’s about getting lost in books, and should come across as sweet, earnest, and perhaps a bit nostalgic for the average reader. Recommended for: fans of beautifully illustrated picture books, readers large and small, or old and quite young, and especially anyone who sees a book and knows that enchantment awaits inside. The Fantastic Flying Books of Mr. Morris Lessmore will be released on June 19th, 2012 from Atheneum Books for Young Readers (Simon & Schuster). For more on the film and app that preceded the book, check out the website.